When you go to a training day as a teacher someone always wants to show you an inspiring quote, or a cartoon, or a youtube video about how fantastic teachers are. I think this is an odd aspect of our profession and I often wonder whether other professionals like dentists, aged care nurses or mortgage brokers feel the need to give each other backrubs before getting down to the business of deciding how to better do their jobs. I think part of the reason for this tendency is our belief in the heroic teacher. That one amazing personality that will change the lives of their students forever. 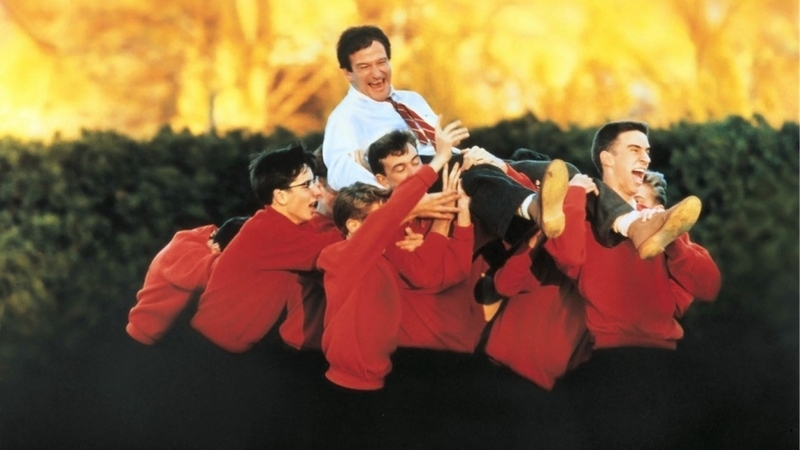 For English teachers, it's Robin Williams whispering "Carpe Diem" in Dead Poets Society. For Mathematics teachers, it's Jaime Escalante teaching AP Calculus. Some people can teach, others just can't. Right? Teaching is a job that requires a certain amount of ego. You have to call for silence and stand in front of a group of jaded teenagers with the solid conviction that what you have to say is what they should all listen to for the next hour. But I guess most of us give up our heroic teacher fantasy pretty early on. I have realised that just doing our jobs moderately well is going to take a lot from us, that lighting Plutarch's "fire to be kindled" is a tricky thing when the wood is wet and your metaphorical matches have all been burned out, and that Johnny Depp is unlikely to want to play you in a bio-pic unless he falls on very hard times. I still want to be the better teacher. I still love it when you can see a kid glom on to some idea, or when you overhear a conversation about your class in the corridor. Atul Gawande, one of the writers who was the original inspiration for this blog recently gave the commencement address to the graduating class of the Harvard Medical School. In the speech he spoke about how medicine had become less of a career for heroic individuals and more of a career for those willing to contribute to an overall system of care. He opens with a description of medicine as practiced in Boston City Hospital in 1937. We were craftsmen. We could set the fracture, spin the blood, plate the cultures, administer the antiserum. The nature of the knowledge lent itself to prizing autonomy, independence, and self-sufficiency among our highest values, and to designing medicine accordingly. Teaching could be the same. We want to be Socrates asking questions in the street or A.S. Neill in a one-room schoolhouse in Scotland rediscovering the fundamentals of childhood. But that kind of attitude is never going to make a difference to the broad population of students. We need to work within systems to change things. If you want to redress inequity in the outcomes of all students, if you want to have a broad love of your subject across the population, or if - like me - you just want to make it socially unacceptable to read from PowerPoint slides, if you want to do anything worthwhile you can't do it all by yourself. Being a great teacher has to mean improving the teaching of those around you. And it has to mean improving the learning of students even when they're studying for someone else's exam. The most poisonous idea in education is that teachers are born rather than made. It's another example of the fixed mindset that stops learning in all kinds of situations. We have to believe that it is possible to make all teachers better. That we can grow together as a profession to offer something better to our students. So we have to stop patting ourselves on the back and playing youtube clips of how excellent we are and start focussing on what really works and what really doesn't. Second, you must grow an ability to devise solutions for the system problems that data and experience uncover. That means working with administrators, students and parents to fix the things that don't work well in our schools - rather than complaining or just trying to shield our classrooms from the worst of it. This is the hardest thing. Once we've identified what works, how do we get others to do that? How do we spread success within our school or across to different schools? How do we stop common practices that are counterproductive? If you took the time to listen right to the end of my interview with Dylan Wiliam you'll know that he sees this as the last big problem in his work. I don't have any easy answers either. By the way, it's a really cool youtube video just in case you detected my tone and didn't click on the link.